Hey, peeps. And hey, New Peeps I've Met At Blissdom. Just taking a quick break for a public service announcement. I've been talking with lots and lots of moms. And when I say that I have a kid with cerebral palsy, I've been getting that pity look and the occasional "Awwwwww......" This is something that typically happens when I meet new people. And so, I figured I'd put up a post I originally wrote for PhD In Parenting to help you understand why my little boy, Max, is not a kid to be pitied. I know, it's hard to know what to say, but rest assured Max is a happy camper who defies the doom-saying doctors every single day. Also, take note of the good hair. I'm going to quote Kevin Carroll, the motivational speaker we just heard today: "Circumstances do not dictate someone's destiny." 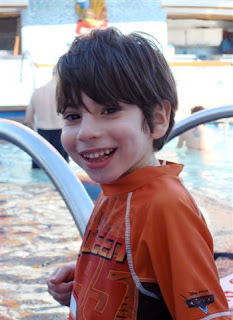 Oh, and please don't pity me, either; Max is an amazing kid, not a tragedy. If you want to pity me for anything, do so because when I called home last night and said to my five-year-old, "Do you miss me?" her response was, "MOMMY!!! WHAT are you bringing me HOME? DO THEY HAVE ICARLY DOLLS?" This is my little boy, Max. He’s seven. At first glance, he may look like any other kid. And in many ways, he is like any other kid. He loves chocolate ice-cream, trucks, airplanes, his toy tractor, chocolate ice-cream, t-ball, splashing around in the pool, the movie Cars, pulling his little sister’s hair. And also, chocolate ice-cream. Max actually has cerebral palsy. It’s a scary term, I know. Before I had him, it seemed like a terrible fate to have a kid with disabilities. Then I had a kid with disabilities. Max had a stroke at birth. Crazy but true: Babies can have strokes. It was a stroke that damaged both sides of his little baby brain. My husband and I were told that Max may never walk or talk, that he could be mentally retarded, that he might have vision and hearing problems. Every single one of my nightmares became a real possibility. Max walks. He runs, too. He speaks words. He sees fine. He hears perfectly. He’s bright. He’s funny. He’s interested in the world. Yes, he has his challenges: He cannot talk fluidly, and he has trouble using his hands and chewing food. But he’s doing really well for himself. And he makes me happy, blissfully happy, every single day. Because he’s so sunny, because he’s a fighter, because he is an all-around phenomenal kid. That might not be what you’d think if, say, you were to spot us at the playground. You might feel sorry for my child. I know, Max may look a little pathetic when he drools or when he’s struggling to pick up something and he can’t. But, trust me, he is perfectly content with who he is and one very cheerful, life-loving child. Who will someday be quite the ladies’ man, I know, but I’m not quite ready to worry about Max and dating. Maybe when he’s seven. You might think that my child should be treated differently than other kids. Nope. Max likes it when you talk to him. He likes it when you joke around with him. He likes it when you fart (although I’m not expecting you to do that). You might think that your kid and my kid don’t have much in common. It’s true Max may not be able to do some things other six-year-olds can do, or do them in quite the same way. But just like your kid he likes to play, pretend, laugh, get silly, touch dirt, roll in the dirt, get himself entirely covered in dirt, bring home dirt, track dirt all over the house. You get the picture. You might think it’s rude or awkward to pull your child aside and explain that my child has special needs. Actually, I’d appreciate it if you did do that. Sometimes, kids don’t know what to make of Max or how to play with him. I can certainly jump in and explain things to your child, but it’ll be much more reassuring and encouraging coming from you. Say it however you wish–“This is a child who can’t talk like you do but who likes to play just like you do, you may just need to have a little more patience with him”—but please, say it. Your child will learn about kids who have special needs. My child will feel included. Everyone will have fun. What could be bad? Max is just a kid. A kid with special needs but still, just a kid. So well said, Ellen. Hope you're having an excellent time! Well said, Ellen! My Thomas also has defied them doctors and I think he's a glorious child to behold and not to be pitied. When others say "I'm sorry to hear that!" when I say I have two special needs children, I always reply "I'm not!" To was a fantastic read and I think you done a great job getting your point across. Max sounds like a great kid. And you sound like a very proud mummy. My son has Asperger's I feel I do't get pitty I mostly get the looks of people that are thinking omg that child is so rude or that mum needs to do a better job controling that child. But like you I love my child and I would ever change him. If people can't understand autism then thats there problem. I especially like the last two points - I might borrow them (and link back of course). Many parents just don't know - and don't want to upset me. Have fun! Saw your Tweet about this post in the #blissdom stream (though I'm not there). I enjoy your candor and heartfelt words of wisdom! I just have to share this with you. A close friend has 2 sweet boys and I was/am close to them both. Lucas was in my class and his big brother, Zach had needs so great that he was homebound with 24 hour nursing care. We included Zach in all that we did by sharing stories or just making him pictures. We celebrated Zach even though he couldn't come to school. When Zach passed away, Lucas asked me to come to the house to be with him. I will NEVER forget that night as we read books and played star wars. Lucas would not go to bed until we read to Zach. It was the most tender and difficult moment of my life. Even in his passing, Zach was full of life and his little brother knew him as the awesome big brother that he was. Blessings to all who love and know what is really special about special needs children. Cheers to you for sharing! Loved this the first time around...and love it still! So very very true! Wonderful, Ellen, as usual. People who pity our kids mean well, but it really doesn't help at all. Ellen, you are doing all of us s.n. moms a service while you are there. We are living vicariously thru you. Keep it up! We need someone out there r-e-p-r-e-s-e-n-t-i-n-g us! Have lots of fun. Thanks Ellen -- I will call you The Lorax from now on! As Deana already said, great the first time and still great. It seems like I've been getting lots of "I'm so sorry" type of statements when folks learn about Luke's autism. I LOVE this post. Growing up as the big sister of an amazing, wonderful guy with cerebral palsy (now 28,) I spent many years trying to protect him. I didn't have a blog-voice when I was 9 and he was 7, so I appreciate your voice here. Thank you for letting me read your story. I'm at Blissdom and would love to find you tomorrow. Wish I could run over to Nashville and meet you, but I am working all weekend. Healthcare sux! Very well said, Ellen. Thank you for being the strong woman that you are. Seriously. I wish when people heard the word "stroke" or "CP," they'd respond with something more along the lines of, "I bet it doesn't stop her one bit!" Because that's true. A response of "That's so sad!" is not. Thank you for this wonderful post! It bothers me so much that people talk over kids and not too them. I know for many it is hard to see beyond a disability - it was for me too until I learned to. Hugs and have a blast at Blissdom - Kudos to writing this post! Very well said! Have a great time at Blissdom! You've shared, and taught, so much. Thank-you for this because you answered a lot of questions for me. Questions that I would have assumed the wrong answers for. If my children and I run into a child with CP, I will know better how to handle the situation. I want to do it with grace. I want to do it with dignity and I want my children to do the same. I just hope the other mom thinks like you do! Ellen, my aunt had a boy with CP. Unlike Max, however, James was virtually an infant. Whenever people gave her that infamous, "Awwww..." she was quick to tell them, "God gave James to me because he knew I was strong enough to handle him. Special children only go to special people, so I know that I must truly be blessed." She was oh, so right; James truly was a blessing! I just want to say that this is so beautiful and so is Max! You need a standing ovation for that. So glad to have met you in real life! I have plenty of friends with special needs and I never pity them or their children. Those are the people that seem to love more, understand more, forgive more, and judge less. Those are the people I admire, not pity. I wish I could be more like them. You rock and I am so glad that you stand up for yourself, your son, and other families about this subject. Now, I need to know why is it that you do not have a book out for parents struggling with a child that is not typical? am absolutely in love with your strong voice and your confidence in what you're doing. This was beautiful. Max is lucky to have a mom like you! I totally agree with what you have written. I have a daughter with a physical disability and one with bipolar disorder and wouldn't trade either of them for anything. Thanks for the great article! Yes, yes, yes. My daughter was healthy until the day after her 3rd birthday, when she came down with a brain infection that has left her with severe seizure disorder, sensory integration problems, speech, balance issues and hearing loss. But she is still the same AWESOME little girl she was. I am blessed - not tormented - by being her mom. And I love your tips about how to address special needs kids in public from a child's perspective.